commercial bodies and all other loads. 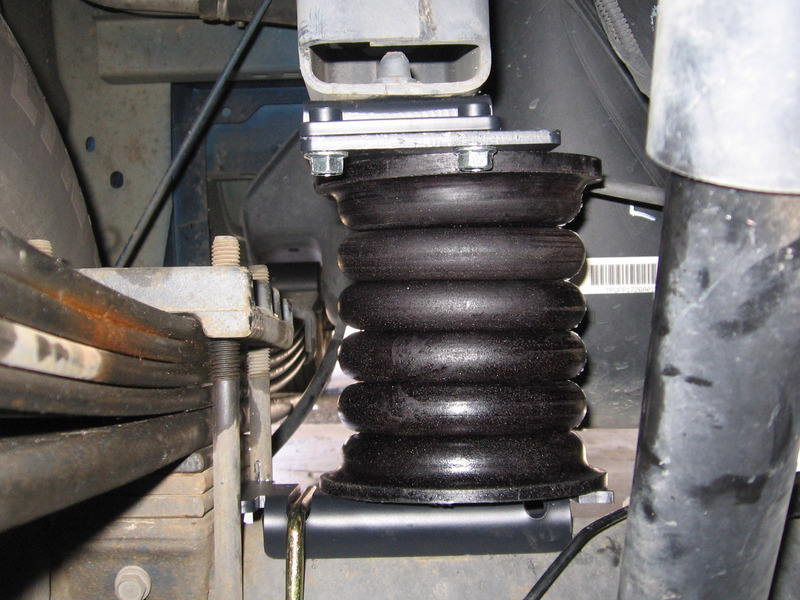 Responding to customer requests and feedback was the motivation for producing the world’s first and only “airless airbag” suspension system for trucks and vans –SumoSprings. SumoSprings are manufactured from an advanced high grade, closed cell polyurethane foam; ideal for the tough truck underbody environment. The product underwent testing in extreme conditions ranging from blistering US desert summer days to the frigid Canadian winter nights. Combining heavy loads with extreme terrain and temperature conditions over eighteen months of testing ensures their performance in any similar conditions our customers might encounter. SumoSprings are manufactured in a propriety multi-stage hot casting process resulting in a unique closed cell microcellular foam with the following characteristics. 1. Minimal expansion under loading, will work in confined spaces. 3. Excellent abrasion resistance, highly resilient to oils, salts and UV rays. 4. No possibility of a system failure due to leaking air, No air lines or compressors. 6. 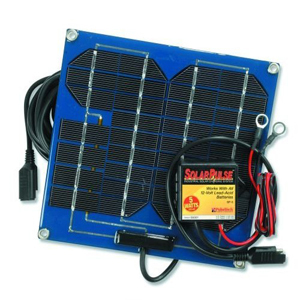 Indifferent to weather extremes, can handle temperatures ranging from – 40 degrees to + 200 degrees Fahrenheit. 1. Zero maintenance required ever. 3. The microcellular foam material delivers a progressive, cushioned load engagement producing a smooth, comfortable ride for the driver. 4. SumoSprings kits have all been designed to be “no-drill” installation. 5. 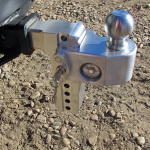 All kits ship fully assembled in the box to facilitate a quick, easy, bolt-on installation. 6. Levels your load and maintains front end alignment for safer driving. 7. 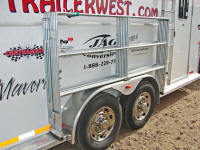 Reduces sag, bounce, sway and bottoming out. 8. All proudly made in the USA. Simply “Fit and forget “your SumoSprings today. All SumoSprings utilize patented micro-cellular polyurethane foam formulated with exclusive additives. The resulting combination of exclusive raw material and engineering design produces a graduated spring rate curve which results in progressive compression under load and variable road conditions. 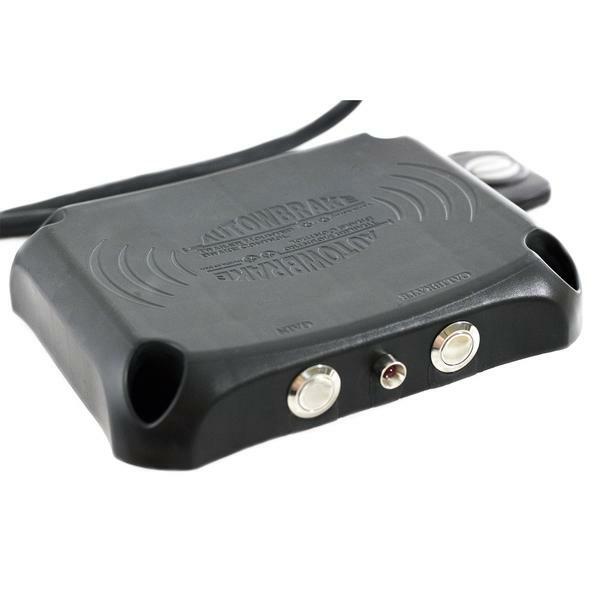 This produces a smooth ride and provides additional load support. · The highest quality polyurethane available delivering unsurpassed dynamic performance. · High compression rate with full memory rebound. · Extremely durable material with excellent abrasion, cut resistance and low temperature flexibility. · Engineered surface profile provides minimal transverse expansion – unlike an air inflated product which expands laterally when compressed, the SumoSprings compresses in on itself when under load. 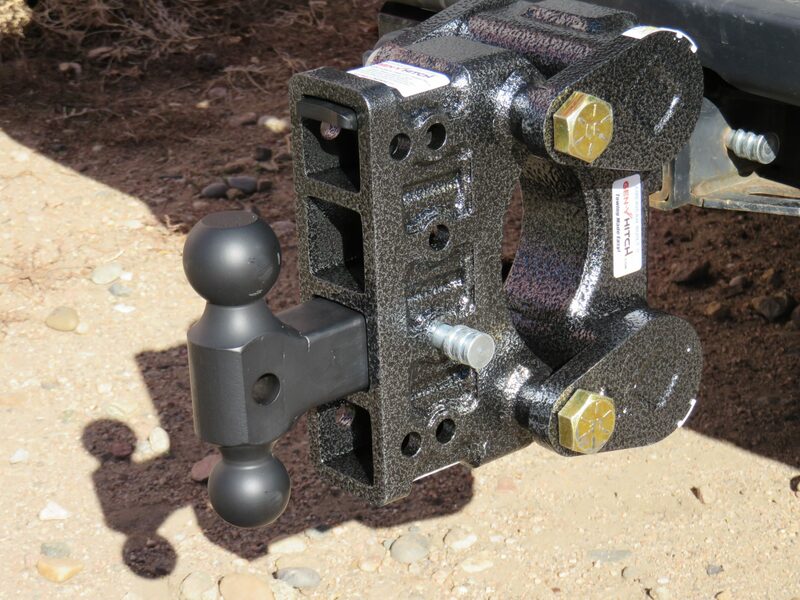 Front SumoSprings – permits a far smoother load engagement than other products. 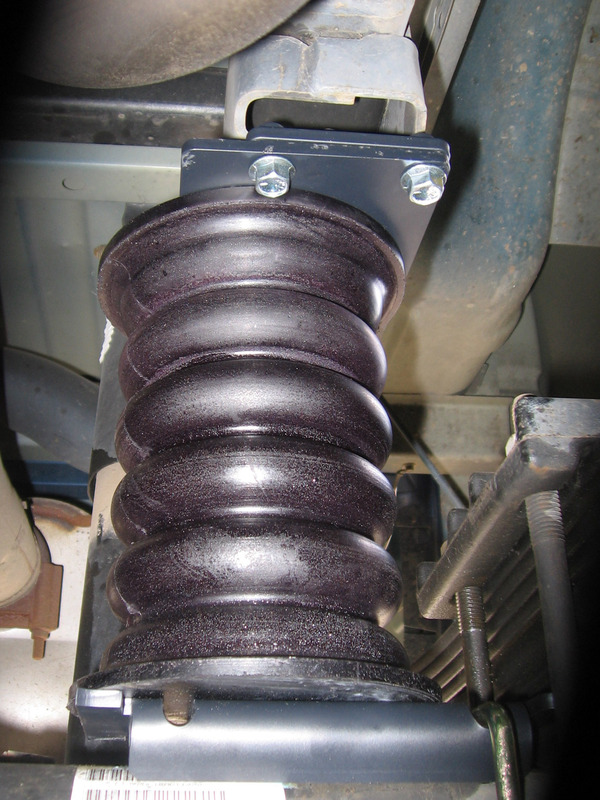 More than a mere bump stop, this variable rate spring with load capacities of up to 3,000 pounds* eliminates the unforgiving “banging” effect produced by similar front-mounted products. 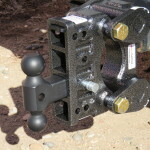 Front SumoSprings are ideal for snow plow, winch and heavy duty replacement bumper applications. They will maintain the original factory ride and only provide additional support when needed. The kits ship complete with all mounting hardware required for a quick, easy installation – typically less than 30 minutes. All SumoSprings kits are manufactured and assembled in the USA. Eliminate leaking airbags by installing replacement SumoSprings bellows that are LEAK PROOF, MAINTENANCE FREE and provide you ‘fit it and forget it’ peace of mind. 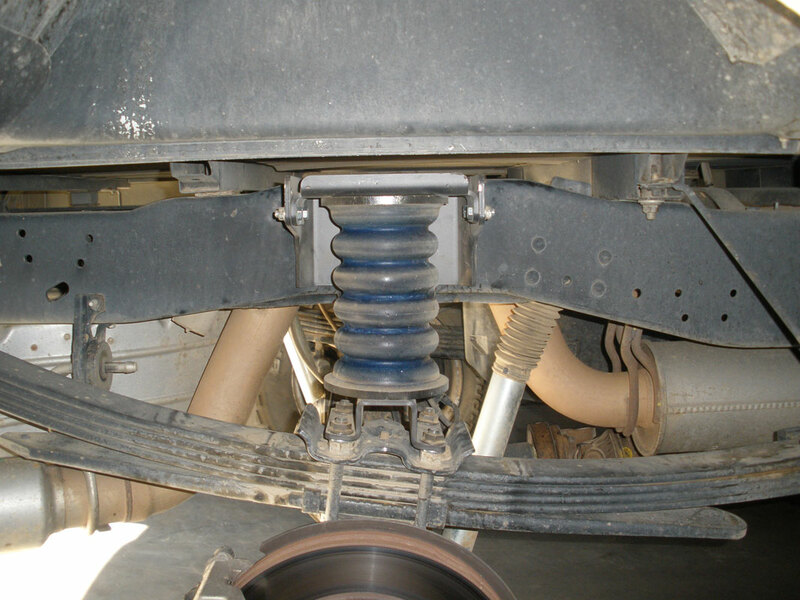 SumoSprings rear suspension systems consist of two primary components; the steel bracket attachment system and the microcellular foam airsprings, airbags or bellows (photo). SumoSprings bellows are the world’s first and only maintenance-free, leak-proof airbags. Additionally, they have been designed to fit existing competitive airbag bracket systems as replacements for ruptured or leaking airbags. The SumoSprings bellows are manufactured from patented microcellular polyurethane foam. The combination of raw materials and engineering design produces a smooth ride; provides additional load support; is LEAK PROOF and completely MAINTENANCE FREE. 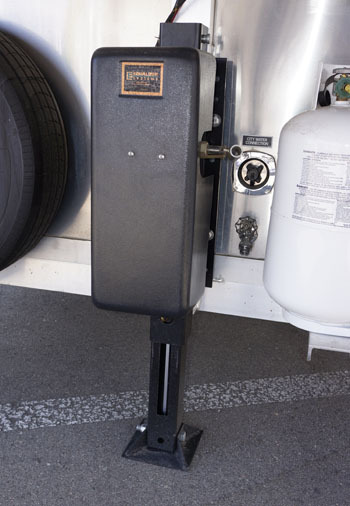 The SumoSprings bellow top plate has a 4-hole drilling pattern which aligns perfectly with the top bracket of all the Firestone™ and Airlift™ airbag systems cross referenced below. 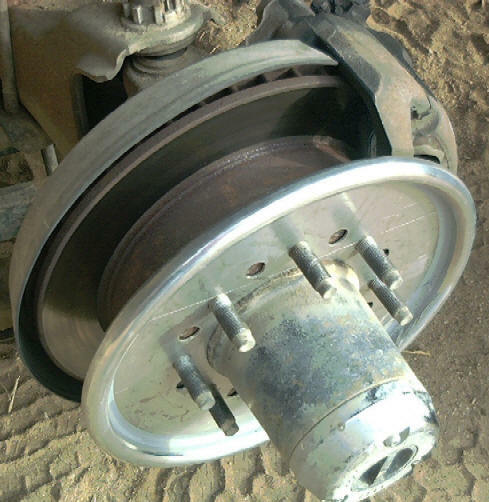 The SumoSprings bottom plate has a centered, single hole. Where this does not correspond with the existing lower bracket system a single 7/16” diameter hole will need to be drilled to complete the installation. 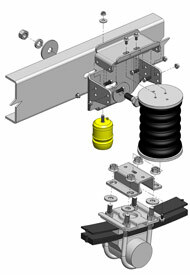 (See notes) Bolts are supplied with the SumoSprings bellows for attachment to the existing bracket system. Firestone™ / SumoSprings / Airlift™ cross reference sheet. The SumoSprings will replace all the Firestone (Ride-Rite) and Airlift air spring item numbers listed below with little or no adjustment required. 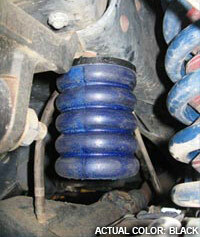 (See notes) Kit numbers are listed to more easily cross reference the appropriate air spring number. 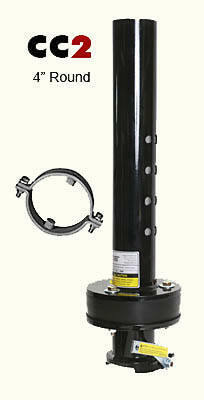 Original Firestone™ and Airlift™ applications have two 3/8-16” tapped holes in the bottom bracket plate. Drill one 7/6” diameter hole in the center of this lower plate to accommodate the SumoSprings bellow. Use the 3/8-16” set screw and fender washer in one of the upper plate holes to prevent rotation. This Limited Warranty extends only to the initial retail or fleet purchaser with respect to use upon the vehicle the SuperSprings™ product is first installed. The term of Limited Warranty shall be measured from the date of purchase. SuperSprings™ reserves the rights to: (a.) require claimant’s proof of purchase as a condition of this Limited Warranty, (b.) make future revisions to its Limited Warranty without prior notice. ALL OTHER EXPRESS OR IMPLIED WARRANTIES INCLUDING MERCHANTABILITY OR FITNESS FOR A PARTICULAR PURPOSE ARE HEREBY DISCLAIMED. 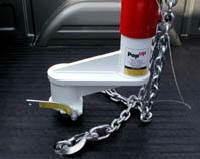 – Vehicle use in excess of GVWR combined vehicle weights/ tow ratings or other OEM design specifications or limitations. – Normal wear and tear, deterioration of spring shape or rating, alteration or failure to maintain. – Scratches or defects in product finishes (powder coating, paint, etc.) or damage due to shipping. – Misuse, including products used other than as recommended in the current SumoSprings application guide or the instructions. – Racing or other vehicle competitions or contests. Accidents, impact by rocks, trees, obstacles or other aspects of the environment. The exclusive remedy provided hereunder shall, upon SuperSprings Internationals’ inspection and option, be either repair or replacement of product or parts covered under this Limited Warranty. Customers requesting warranty consideration should first contact the independent distributor from whom you purchased your SumoSprings to obtain a Returned Goods Authorization number. All removal, shipping and installation costs are customer’s responsibility. If a replacement part is needed before yours can be returned, you must first purchase the replacement part. 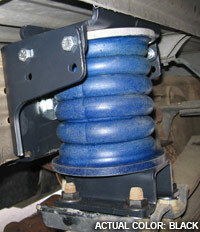 Then, if SuperSprings™ deems your part warrantable, you will be credited the purchase price. Your warrantor is SuperSprings International, Inc. If you are unable to submit a warranty claim through your distributor contact SuperSprings™ customer service at 800-898-0705 or the address indicated below. In consideration of the purchase price paid, neither SuperSprings International, Inc. or any independent SuperSprings™ distributor are responsible for any installation or removal costs, time loss, rental costs, or for any incidental, consequential, punitive or other damages you or third parties may incur in connection with any product purchased. Your exclusive remedy hereunder for covered parts is repair/replacement as described above. This Limited Warranty gives you specific rights. You may also have other rights that vary from state to state. For example, while all implied warranties are disclaimed herein, any implied warranty required by law is limited to the terms of Limited Warranty described above. Some states do not allow limitations of how long an implied warranty lasts and /or do not allow the exclusion or limitation of incidental or consequential damages, so the limitations and exclusions herein may not apply to you. 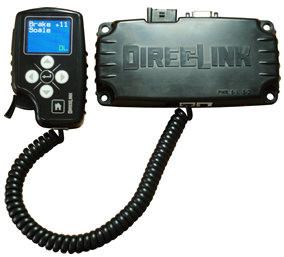 ©SuperSprings Int., Inc. 2008. All Rights Reserved.